Shifting Concretes is a public art project that focuses on how we inhabit our cities, and questions who gets to shape the urban spaces we live in. Bringing individuals from different disciplines together, participants collectively investigate notions of placemaking and conceptualising a public intervention through a series of workshops, expanding their engagement with art and its publics. Key to this interrogation is the reflection and reassessment of our urban experience in our city: What makes our spaces places for those who inhabit in it? How can we reach out to audiences outside the privileged art spheres, to challenge our usual spatial and social relations in direct encounters? 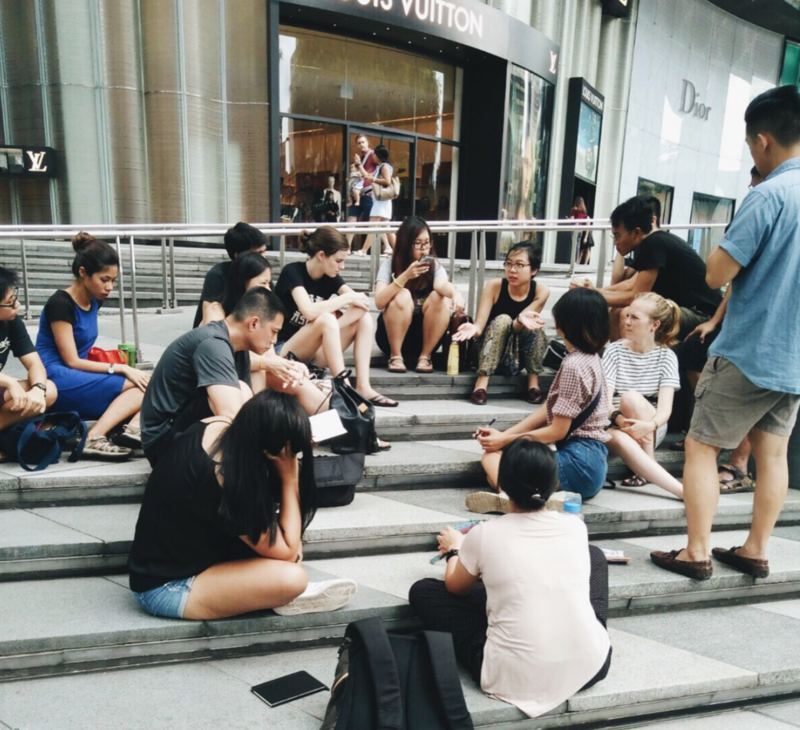 Over the course of a month, participants will be engaged in a series of workshops, working together to conceptualise an intervention that generates much-needed conversations and engagement with Orchard Road. Collectively, participants will reflect and reassess our urban experience in our city, cultivating a social experience of what truly makes this space a place for those who inhabit in it. What started out as an experimental pop-up space to provide more comfortable seating spots, a space for social connection, and an opportunity for pedestrians to reassess their (and our) urban experience at Orchard Road (OR) turned out to be a far more enlightening process about Singaporean attitudes with regards to interacting with our urban jungle and shopping street. in August, a team of us brought together bean bags, picnic mats, fake grass patches, flowers, rugs, pillows and more to invade the pedestrian walkway of OR to encourage passerbys to join us to “lepak”. “To lepak” means to spend one’s time loitering or lazing around in Singlish. But we wanted to overturn such a negative connotation of the term. In busy Singapore, and especially with Singaporeans known not to be the most enthusiastic crowd when it comes to spontaneous participation, I was surprised to find pedestrians of all ages comfortably stepping into the space we built. Teenagers were using our speakers to have a mini karaoke session, parents brought their children to play with the plushies, couples were chilling on the beanbags, and most memorably we managed to attract a group of Turkish tourists that came over to hang out. Our intervention might have had more abstract aims of analysing our urban experience, but it was at its very fundamentals, opening a space to build social connections. Tracing back to the planning and implementation of the final intervention, the workshop itself was also a crucial reflective experience on ways of art making. Constructing this entire workshop as a collaborative experience, my partner and I rejected the notion of first coming up with a product. Rather, we preferred to bring participants through a process of analysing their own perceptions of OR, before proceeding to an on-site mapping and idea formulation, and finally gathering the necessary logistics required for the intervention. From idea generation down to the eventual manifestation of the intervention, the collaborative process showed me both the advantages and obstacles involved in such a manner of art making. It remains a challenge to bring together the expertise of such diverse individuals, and even attempting to best infuse the abstract or ideological into an interactive space for an audience presents its own obstacles. However, it was truly an enlightening journey on the potentials of negotiating space within a highly constructed shopping belt like OR. Our intervention might have made only a small inflection in the busy lives of those passing by, but it was a door for our workshop participants into the possibilities of gaining autonomy over shaping our living spaces. Shifting Concretes set off as an attempt at questioning who gets to shape the spaces we live in, or rejuvenate the spaces that have since been constructed. At the end of the day, the insights I have gained as a facilitator went far beyond the initial inquiry. The boundaries between art and experience, authorship and collectivity, monolithic infrastructures and meaning have been blurred. I believe that the restrained limitations of geographical space in Singapore does not necessarily have to limit the ways we express, behave, or interact with and within such spaces. The nuances of such spatial and social dynamics continue to fascinate me and it is art interventions like Shifting Concretes that allows for the continued negotiations of spatial meaning such that voice, and I believe vitality, can be reinjected into Singapore.